1. Cut 12 pieces of waxed cotton cord approx. 40cm long. Wrap a piece of cord in the middle between two struts of the frame and tie a knot. Then tie a piece of cord in the middle between the first cord and a strut. Repeat for the other side of the first cord. Trim the excess cords. 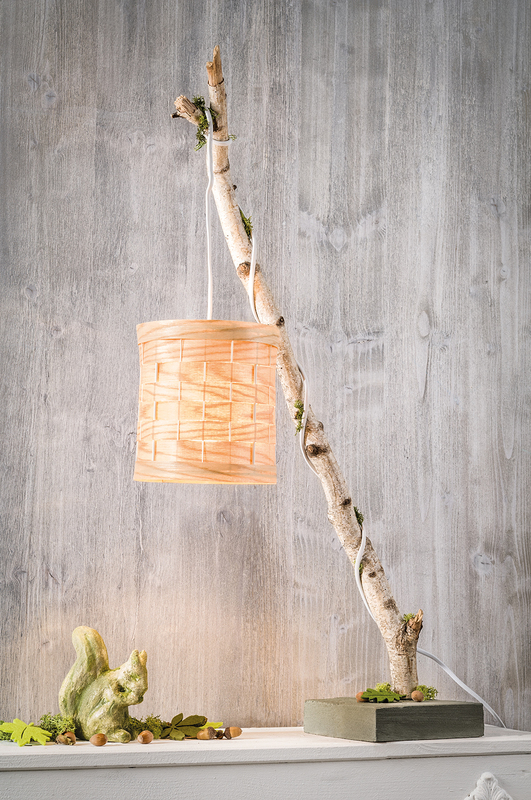 Repeat around the lampshade frame so that you end up with 3 cords even distributed between all the struts. 2. Cut a 50cm long piece of wood veneer. Cut two 3cm wide strips and six 2cm wide strips from this piece. Starting with a 3cm wide strip, position the end behind one of the struts. Weave the strip in and out of the cotton cords and struts. Due to the even number of struts/cords (16), the wood veneer strip will end up exactly at the beginning (i.e. behind a strut). Glue the end of the strip to the beginning (behind the strut) using a hot glue gun. Continue in the same way with a 2cm wide strip, except make sure that it begins in front of the strut rather than behind. Continue in the same vein with three more 2cm wide strips and finally a 3cm wide strip, alternating where you start i.e. in front or behind a strut. 3. 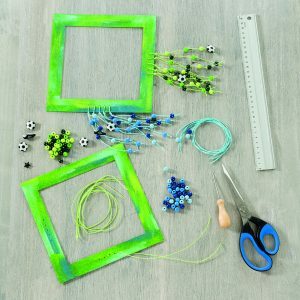 Use the hot glue gun to stick the two remaining 2cm strips around the top and bottom of the frame to hide it. Attach the electric light holder to the frame and insert the bulb. 1. Transfer the lantern pattern (as shown) onto the Creaflexx and cut it out. Cut the openings with a craft knife. Basecoat the lantern with the dark green acrylic and leave to dry slightly. 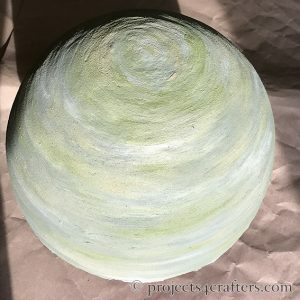 Then apply the other three acrylic paints randomly by picking up a little paint with the brush, dabbing it onto the paint palette and then brushing irregular, different coloured strokes on top of the dark green. Leave to dry. Cut five 40cm pieces of green cotton cord. Thread a length of cord through each hole in one side of the frame to the centre of the cord. Fold the cords in two, tying a knot in each close to the frame edge. Thread 2-3 wooden beads from the green bead mix on the end of the strings with an occasional football button. Tie a knot in the cords after threading each bead, varying the height as you go. Repeat with the turquoise cotton cord and the blue bead mix for the other side of the frame. Repeat for the second frame. Heat a frame from Step 2 and stick it to one side of the lantern with the beads hanging down on the two closed sides. Heat the second frame and stick it to the other side of the lantern. 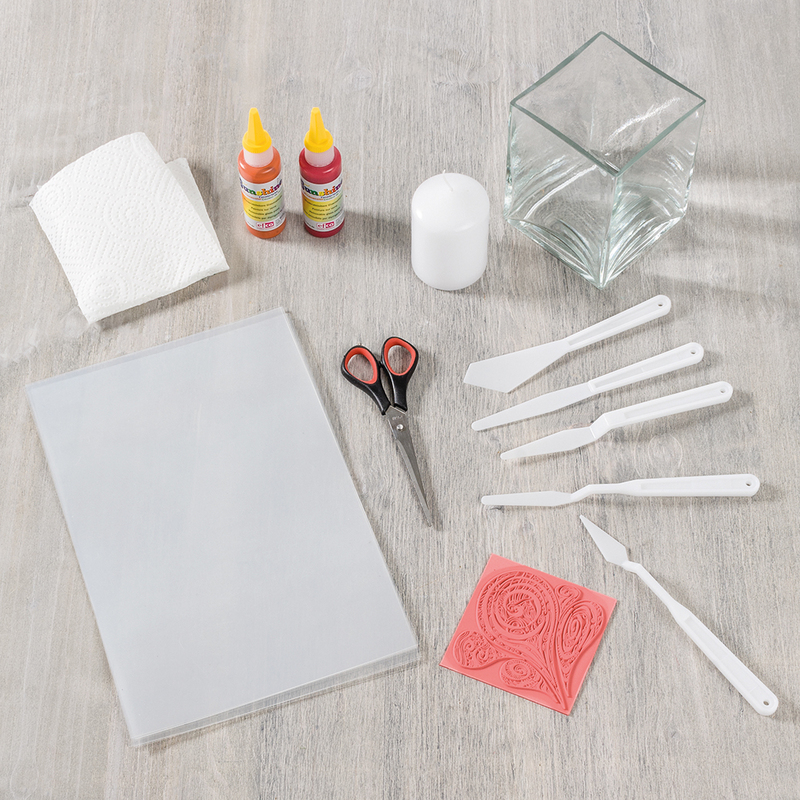 Note: We recommend wearing thin cotton gloves when working wth Creaflexx as the glue can become very hot when heated. 4. Heat and roll up the inner part of the frame (approx. 15 x 15 cm of Creaflexx) to form a 15cm long tube. 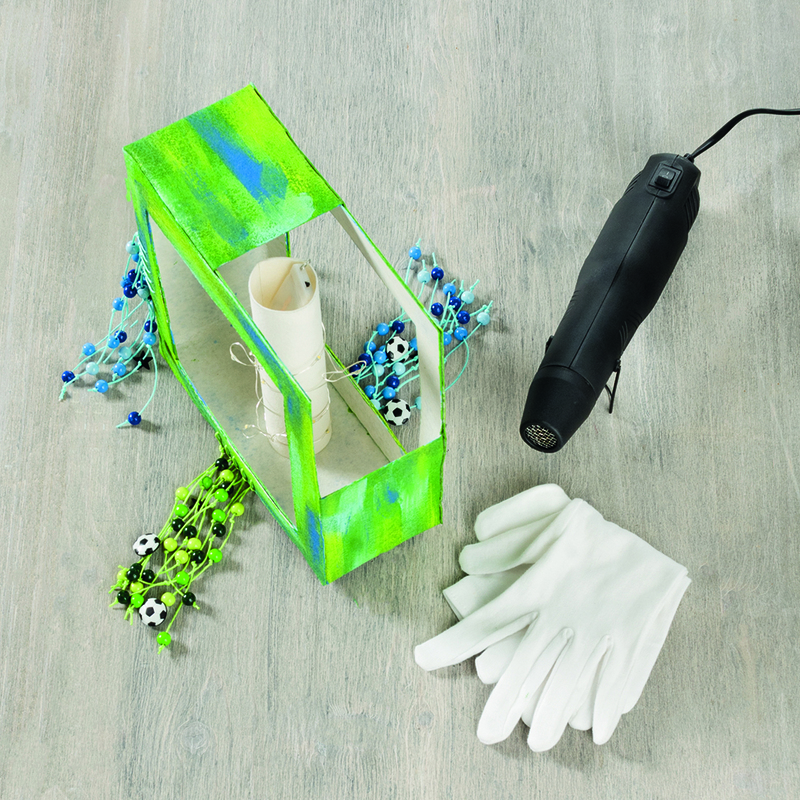 Loosely wrap the fairy lights around the Creaflexx roll and insert the battery compartment inside the tube. 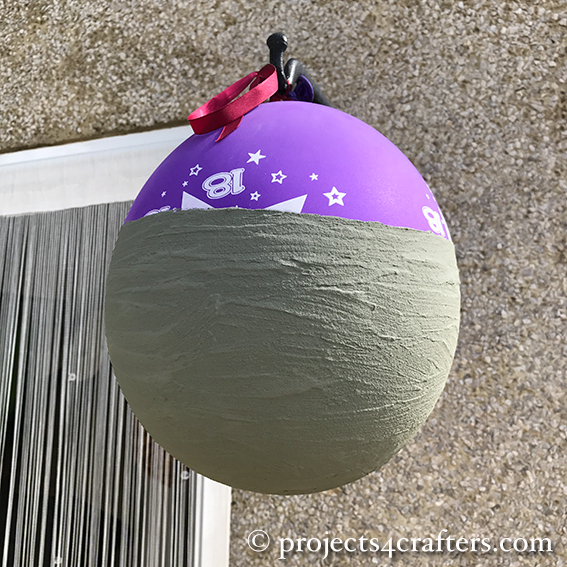 Place the lantern on one side and heat this side from the centre with the heat gun. Press the roll in position in the lantern. 5. Cut out two 19 x 19 cm pieces from the star shine foil. Stick Tacky double-sided tape around the edges of the glossy side of the foils and then stick them to the inside of the lantern. Use the awl to pierce a hole through the tip of the lantern, front and back. 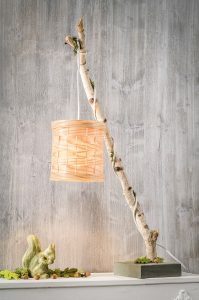 Put a wooden bead on one side of the lantern wire. Bend the wire at about 3 cm and thread it through one of the holes before bending it upwards and sliding the wooden bead down over the end. 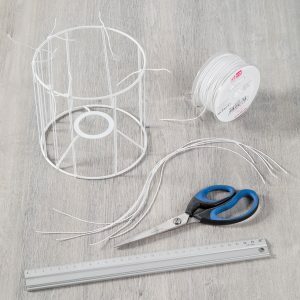 Repeat for the other side of the lantern wire before attaching the lantern rod. Check out the Trends Autumn/Winter 2017 catalogue for Creaflexx and Starshine Foil. 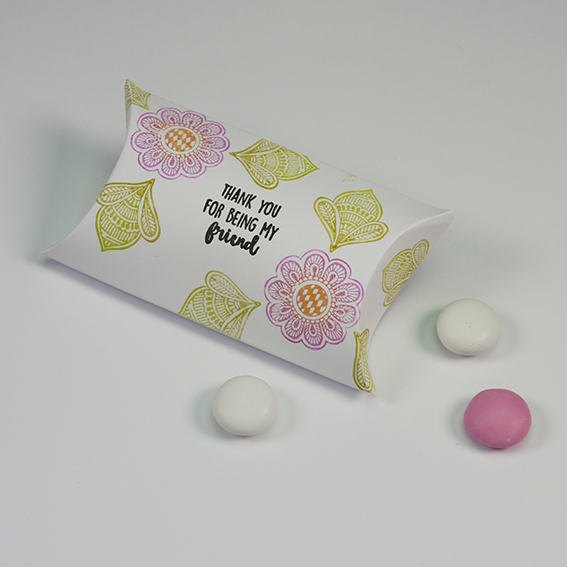 Tyvek is a versatile product as it can be sewn or glued and doesn’t rip easily. Not only does it make it ideal for kite making but also for party table runners, especially themed children’s parties! 1. Cut the Tyvek in two lengthways so you have two 35 x 100 cm pieces. Cover your work surface and place a strip of Tyvek on it. 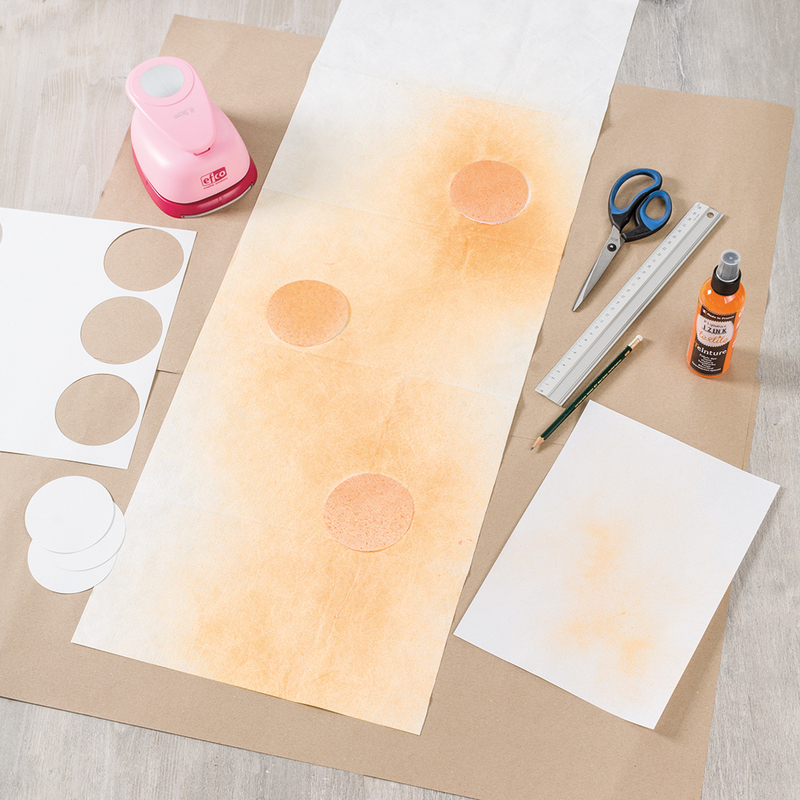 Cut out 6 circles from the paper offcut and spread them over the Tyvek strip. Shake the textile spray before test spraying onto the scrap paper. Then spray the Tyvek table runner with the orange textile spray, paying particular attention to where the circles are. Leave to dry. 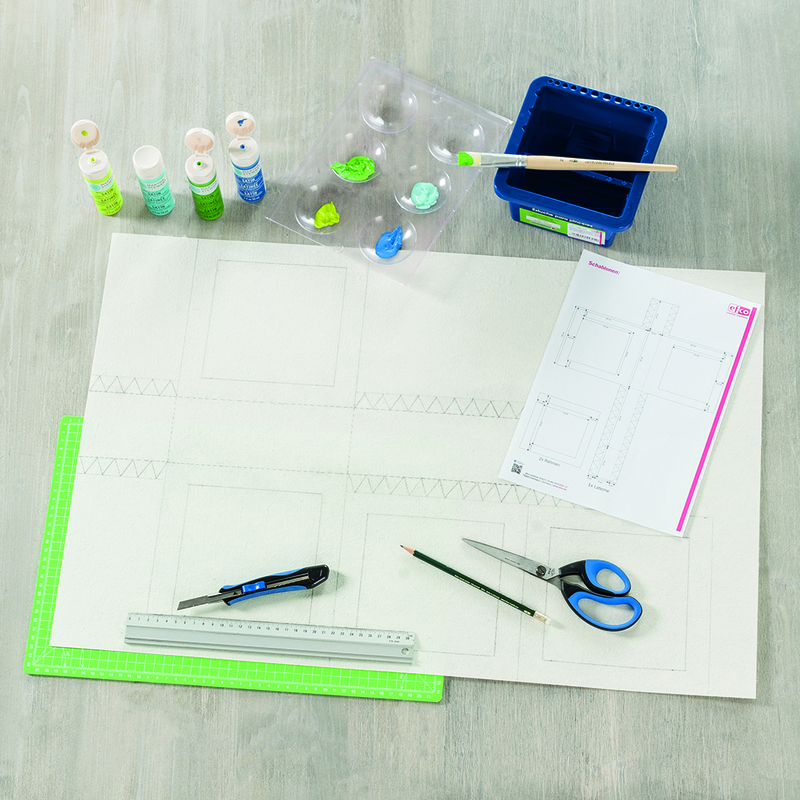 Tip: Tyvek can be sewn or glued together with contact adhesive if the table runner is too short. 2. Cut a piece of lino approx 26 x 7 cm. (Do this by cutting the lino upper surface with a scalpel. Then bend it in two to break it, cutting the woven back with the scalpel.) Place the carbon paper on the lino with the template on top. 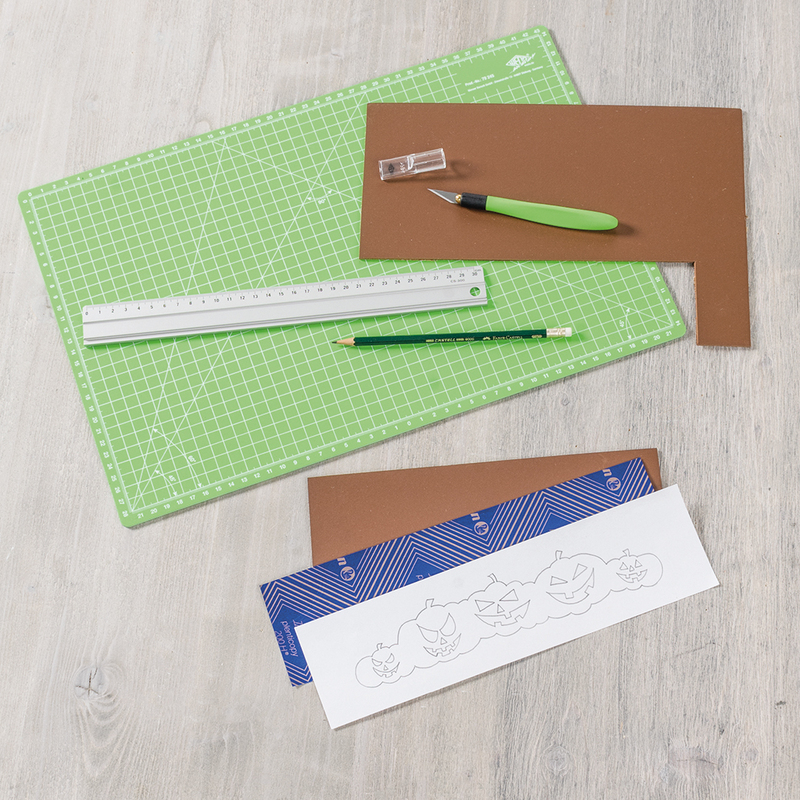 Trace the design with the pencil. NB: The picture on the lino must always be a mirror image of the final design print. This is especially important to note when text is used. 3. 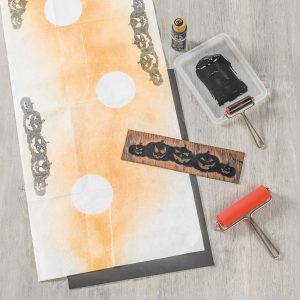 Lino printing is a high-pressure process. 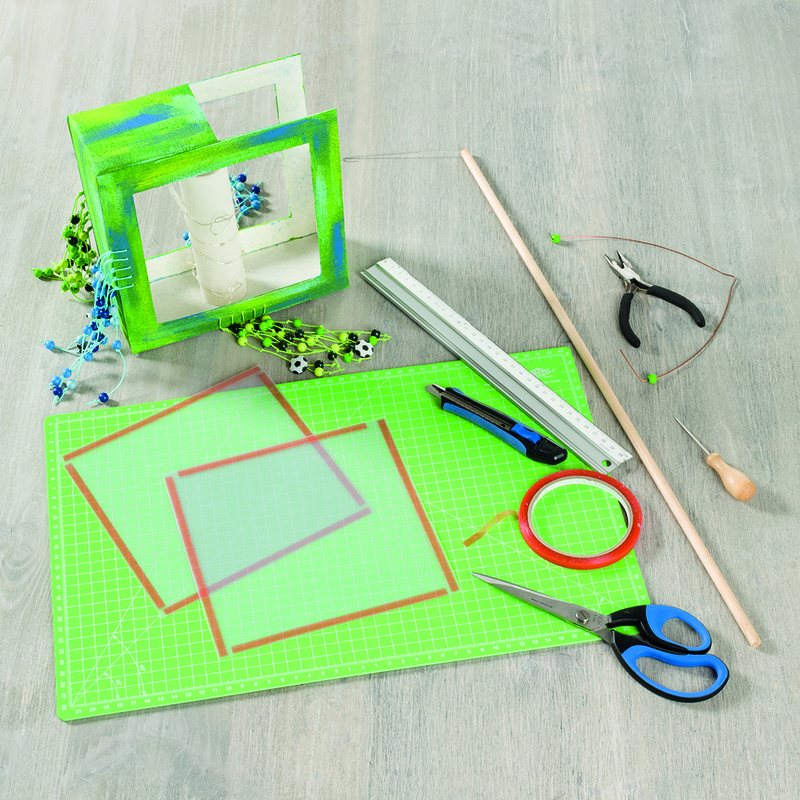 This means that everything that remains on the lino’s surface will be visible when printing whilst everything that is cut away will not. 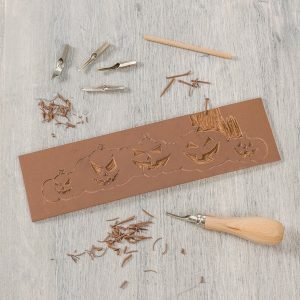 Cut out the contours of the pumpkins with the V shaped cutting blade. Use a slightly wider cutting tool to cut out the eyes, nose and mouth of the pumpkins. Then remove the lino surface around the pumpkins using the wide blade. Since the blades are very sharp, you should always work away from your body. 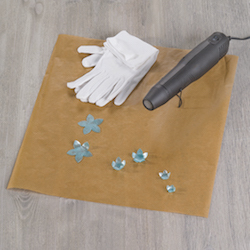 Tip: If the lino is too hard heat the surface with a hair dryer. When the lino is warm it becomes softer and easer to work with. 4. 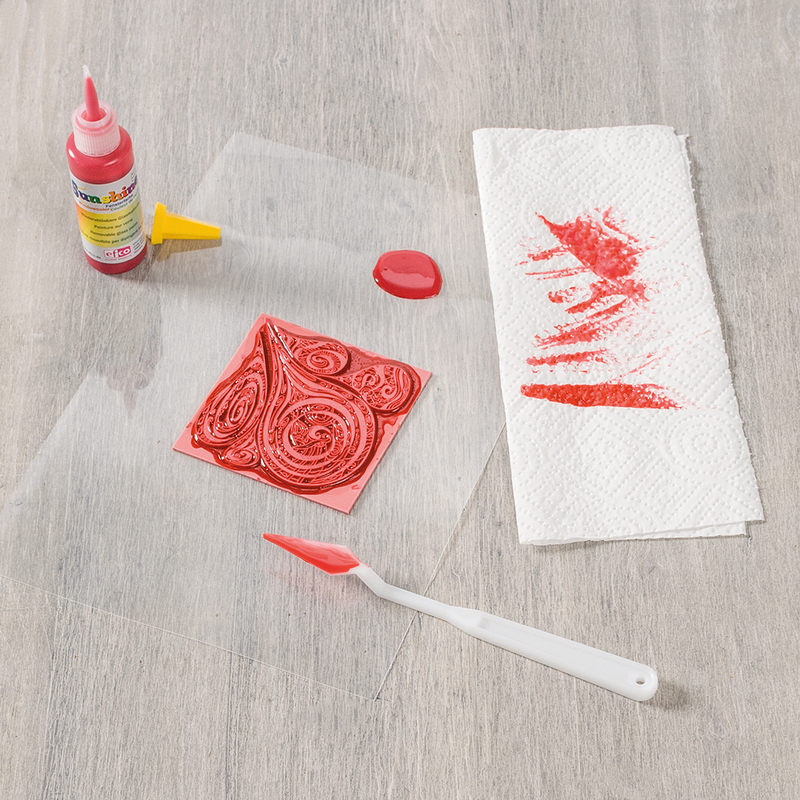 Place the foam sheet underneath the table runner wherever you want to stamp. 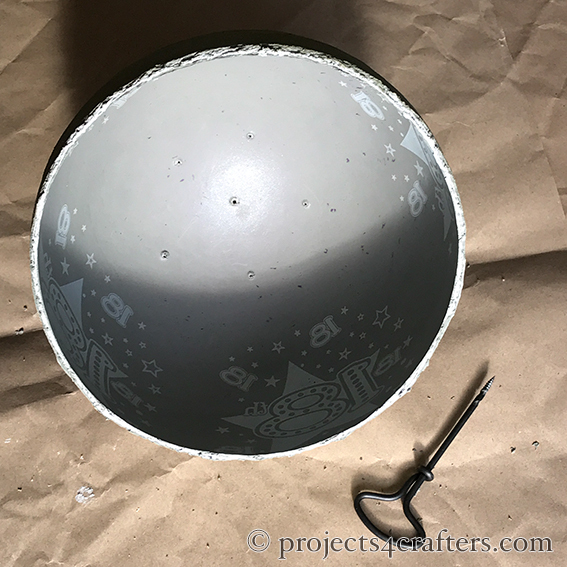 Squeeze a little black acrylic paint onto the old lid and work it onto the small roller. Use the roller to cover the lino pumpkin design with a generous coat of paint. 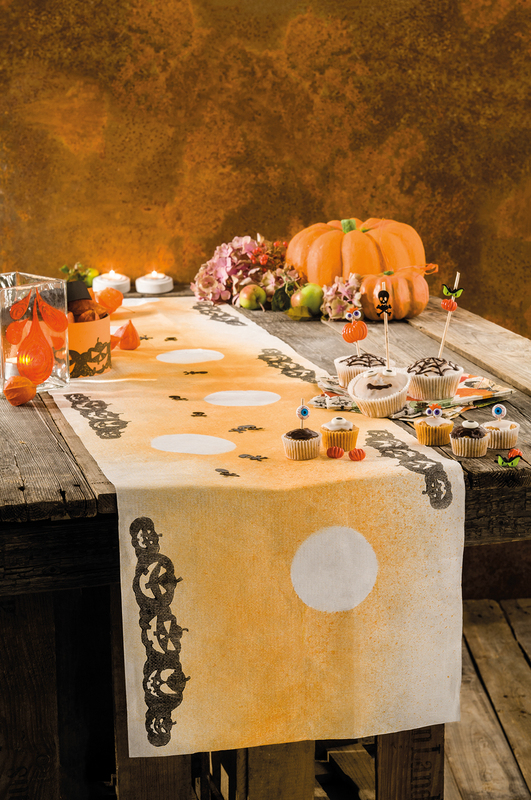 Position the lino face down on the table runner where you want to print the pumpkins. Use the clean large roller to slowly roll over the back of the lino, applying even pressure. 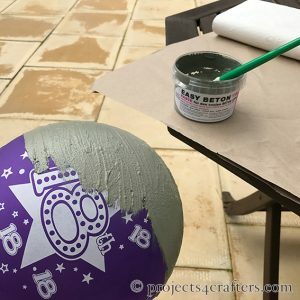 Carefully lift the lino and re-ink it before printing your next image. Repeat as may times as desired. Then leave to dry. Efco’s range of Tyvek products can be seen on Page 92 of the Basics Catalogue. Step 1. Cut 12 pieces of waxed cotton cord approx. 40cm long. Wrap a piece of cord in the middle between two struts of the frame and tie a knot. Then tie a piece of cord in the middle between the first cord and a strut. Repeat for the other side of the first cord. Trim the excess cords. Repeat around the lampshade frame so that you end up with 3 cords even distributed between all the struts. Step 2. Cut a 50cm long piece of wood veneer. Cut two 3cm wide strips and six 2cm wide strips from this piece. Starting with a 3cm wide strip, position the end behind one of the struts. Weave the strip in and out of the cotton cords and struts. Due to the even number of struts/cords (16), the wood veneer strip will end up exactly at the beginning (i.e. behind a strut). Glue the end of the strip to the beginning (behind the strut) using a hot glue gun. Continue in the same way with a 2cm wide strip, except make sure that it begins in front of the strut rather than behind. Continue in the same vein with three more 2cm wide strips and finally a 3cm wide strip, alternating where you start i.e. in front or behind a strut. Step 3. 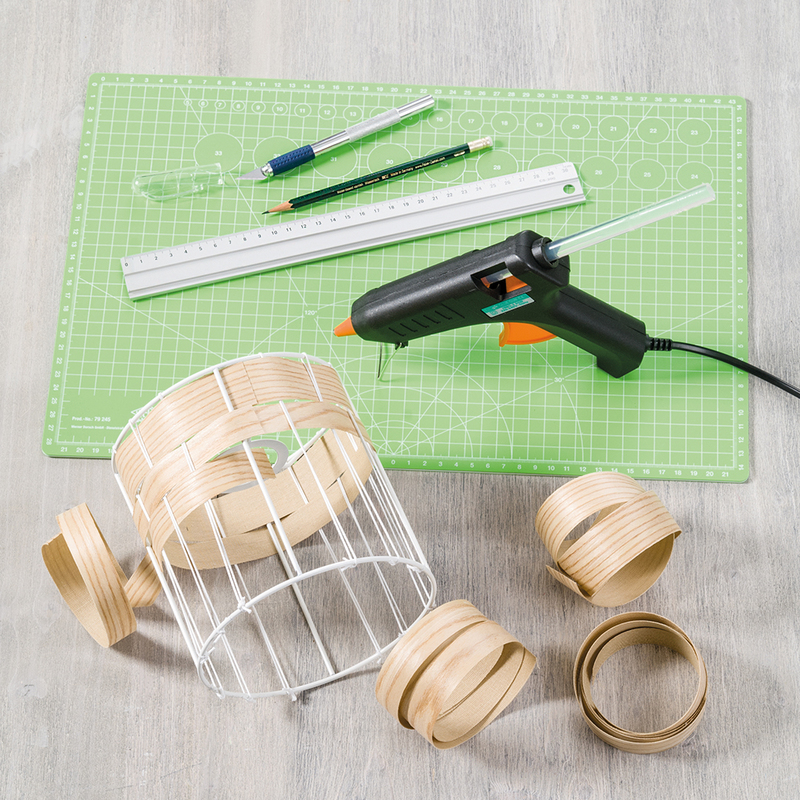 Use the hot glue gun to stick the two remaining 2cm strips around the top and bottom of the frame to hide it. 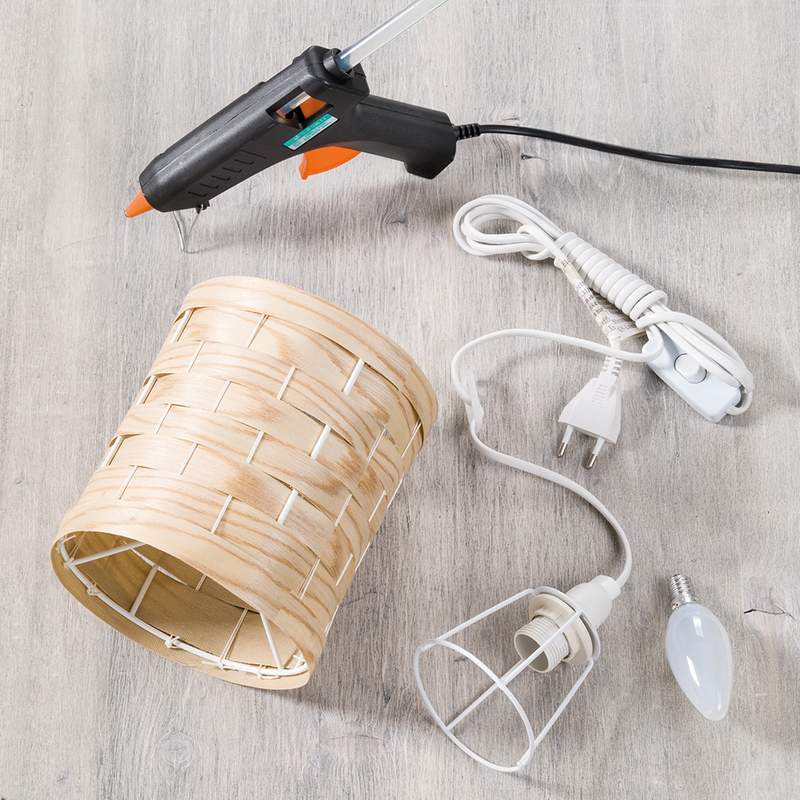 Attach the electric light holder to the frame and insert the bulb. Step 1. 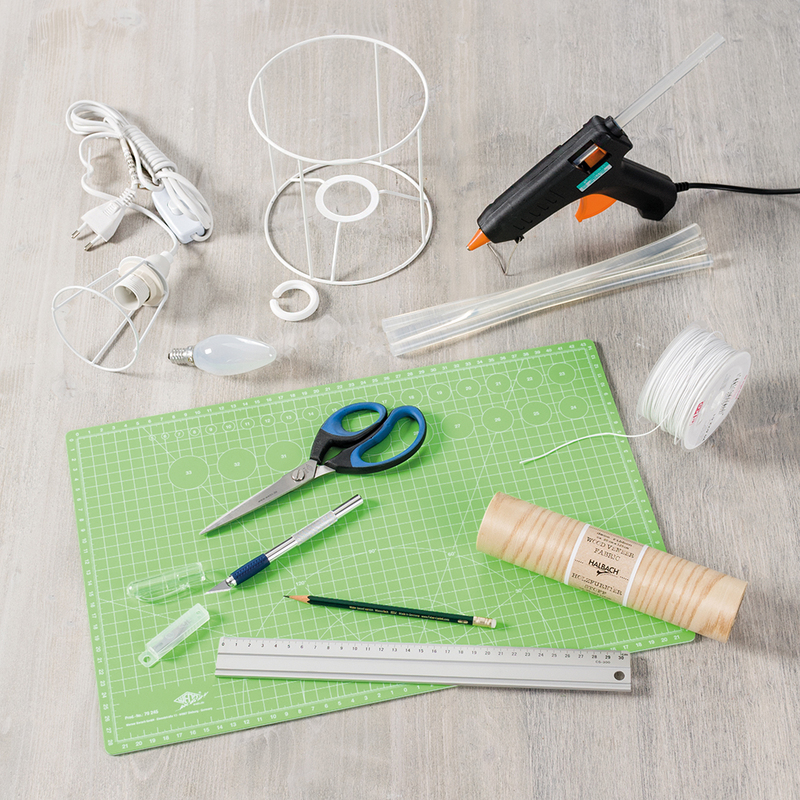 Blow up a balloon and tie a ribbon or string to the end. Paint at least half of it with a thick layer of cement grey Easy Beton Paste. Step 2. Use the ribbon/string to hang the balloon up to dry. Step 3. When touch dry, cover it with another thick layer of paste. Leave to dry. Repeat several times until the paste is approx. 5mm thick (8-9 layers). Step 4. Add another layer, this time blending some light Easy Beton and Easy Moss Pastes for interest. Leave to dry thoroughly. Step 5. When completely dry, remove the balloon, peeling it away from the Easy Beton. Do this carefully as the bowl is flexible at this stage. Step 6. Use a gimlet to carefully drill holes in the base of planter for drainage. Step 7. 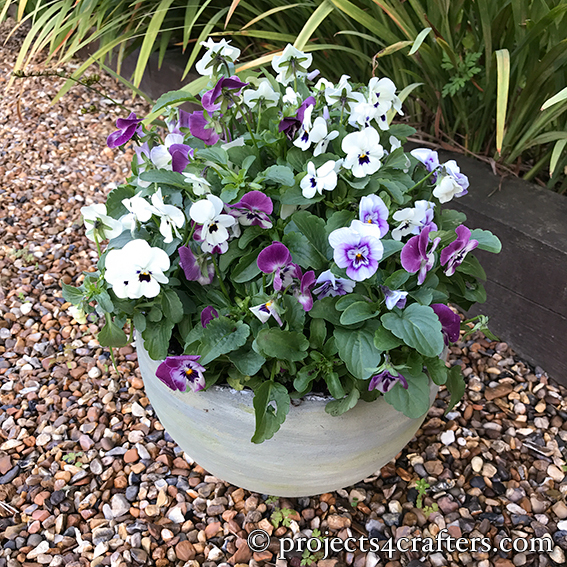 If needed, place some grit or broken crockery in the bottom for greater drainage. Then fill the planter with compost and plants. Alternatively, once you have removed the balloon, you can place the Beton bowl upside-down in a flower bed as structural decoration. 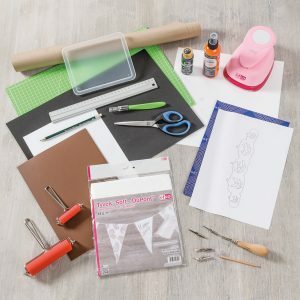 iZink foam rubber stamps and mini pigment ink pads are perfect for creating interesting backgrounds for cards and gift packaging and if stamped onto tissue paper you could even make your own gift packaging! 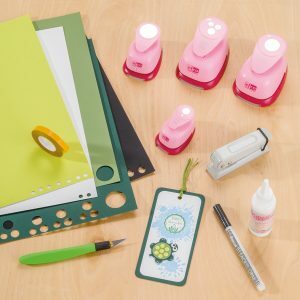 They can be used in conjunction with other stamps and inks too. To view a selection of the iZink range of stamps, embossing powders, and 3D Texture Pastes see pages N.37-N.39 of the Autumn/Winter 2017 Trends Catalogue. Alternatively you can view the full range of iZink products including inks and inkpad sets in the Aladine Catalogue on Efco’s German website. 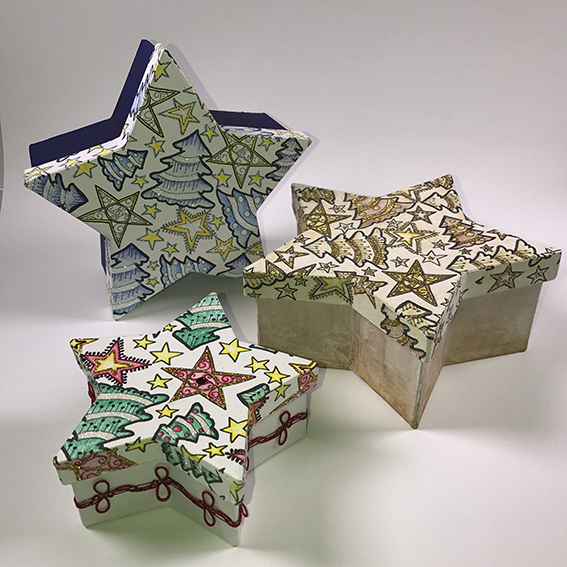 Once decorated Efco’s Doodleart boxes are presents in themselves but they also make excellent packaging for those extra special presents! 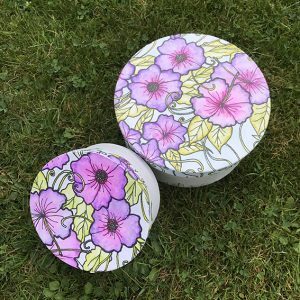 They can be decorated with colouring pencils, pens, watercolour pencils & crayons, alcohol markers, and even inks or paints. Embellishments such as ultrafine glitter and crystals can also be added with adhesive. And to protect them you can even spray them with Efco’s matt, satin or gloss varnish. To see the complete range of Doodleart boxes check out the Autumn/Winter 2017 Trends Catalogue. 1. Place the texture mat on the painting acetate. 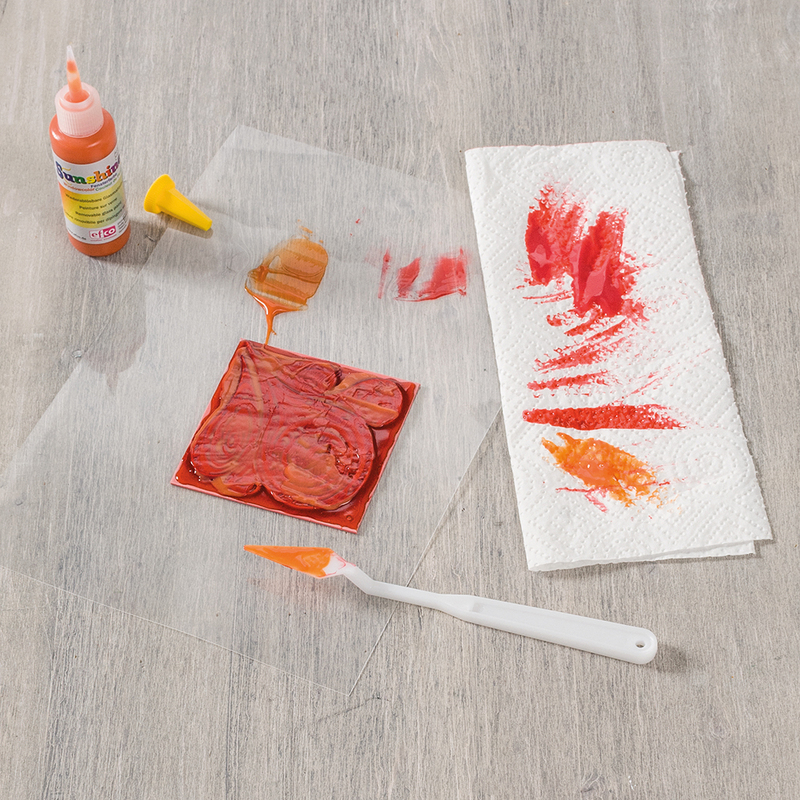 Cover the texture mat with some red Sunshine window colour, spreading it out with the spatula. Make sure that the recesses of the pattern are completely filled with the window colour. Pick up any excess colour with the spatula, wiping it off on a kitchen towel. Leave to dry. Tip: Move the spatula back and forth to remove any air pockets. Also jiggling and tapping the painting acetate under the texture mat can help make the air bubbles rise. 2. Apply a second thick layer of orange Sunshine window colour directly from the bottle over the entire design. If necessary, smooth the surface with the spatula, again, tapping the painting acetate so that any trapped air can rise. Leave to dry. NB: Because this second layer is slightly thicker, the drying process can take up to 2 days. If you try to remove the motif from the texture mat too soon the layers may separate, leaving the relief in the mat. 3. Carefully remove the motif from the texture mat. The best way to do this is to carefully remove the dried paint from the edges first, working your way in to the centre. 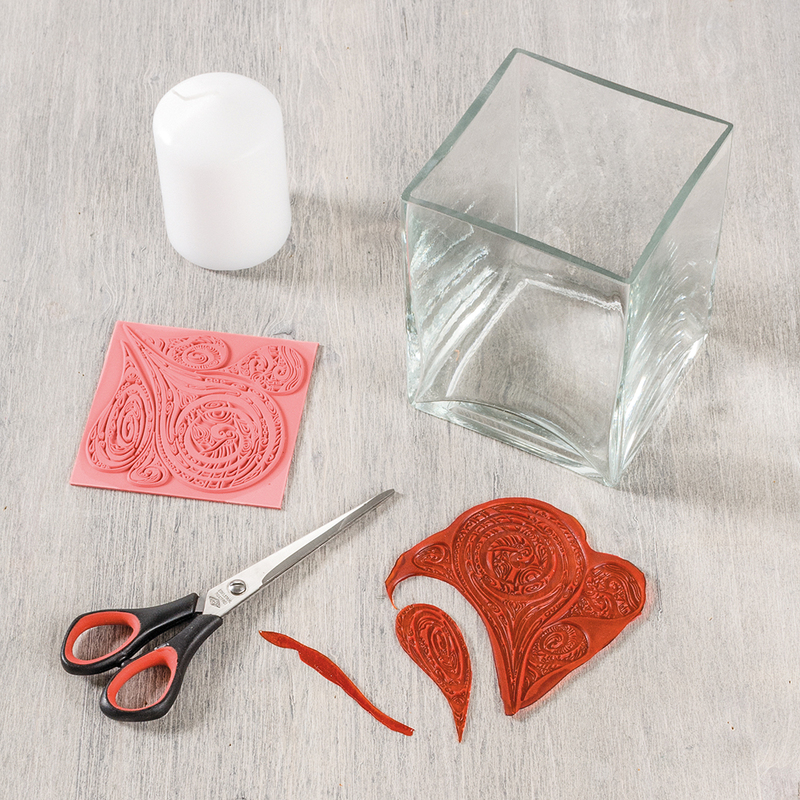 Cut the drops out with scissors and position them on the lantern glass. 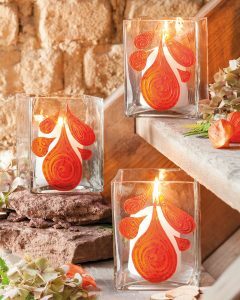 Then place the candle in the vase. 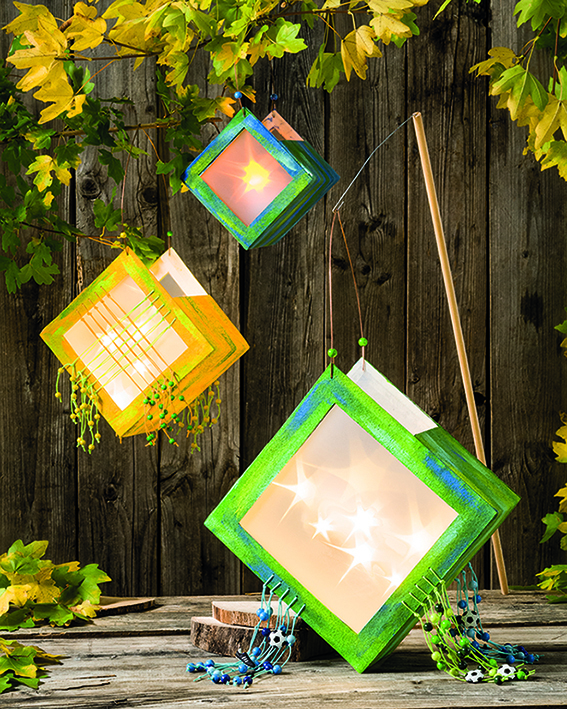 You’ll find the lantern glass in Section 10 Decoration on page 403; Sunshine Window Colours in Section 16 Paints on page 627 and Texture Mats in Section 1 Crafting-Basics on pages 96-101. 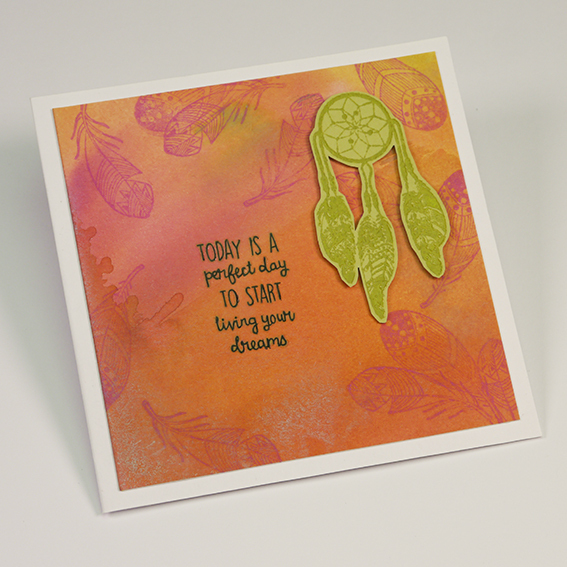 It’s amazing what you can create with simple shaped punches! 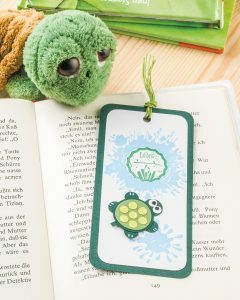 The turtle on this bookmark is from Christine Urmann’s “Mini Figures for Punches” book and is created using different sized circle punches. 1. Cut a 7 x 14 cm rectangle from the dark green card and a 6 x 13 cm rectangle from the white card. Round the corners of both rectangles with the rounded corner punch. Position the large Clear Drops stamp on the acrylic block and ink it up with the light blue ink pad. Stamp it onto the smooth backside of the white rectangle. Repeat with the small Clear Drops stamp. 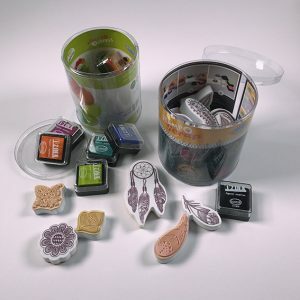 Stamp the Woodies Exlibris stamp with green ink in the open middle area of the large Clear Drops stamp. Leave to dry. 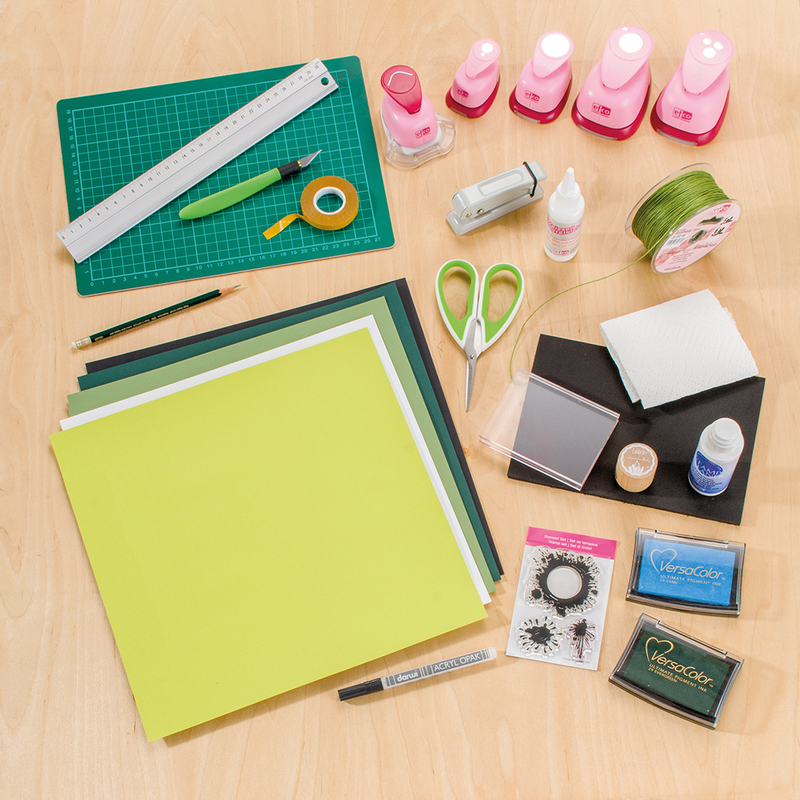 Stick the white rectangle to the dark green rectangle with double-sided tape. Punch a 6mm circle at the top end of the bookmark. Cut four 20 cm lengths of cotton cord and thread them through the hole. Tie all cords together in a knot and, if necessary, cut the ends to the same length with scissors. 2. Create the turtle using punches according to the instructions in the “Mini Figures with Punches” book. 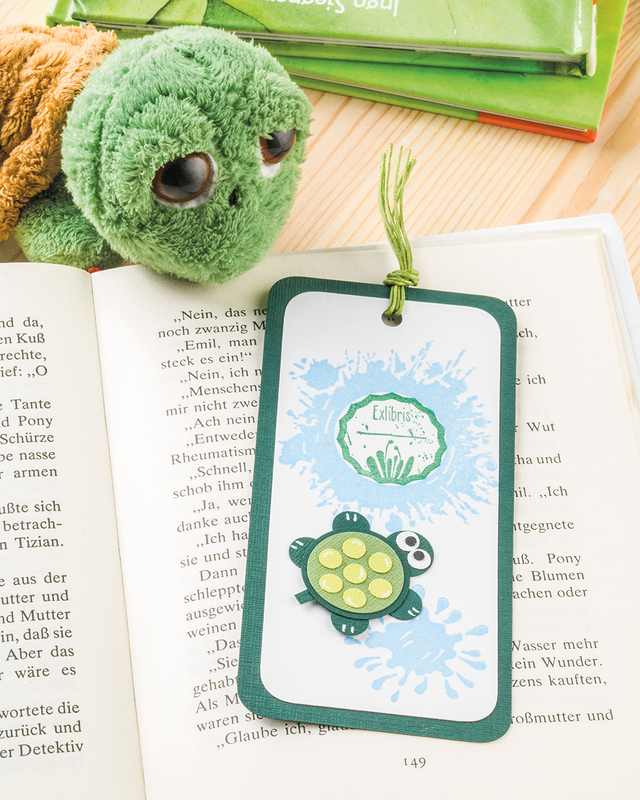 Stick it together using the white craft glue and then stick it to the bookmark with double-sided tape. You will find all the punches and Christine Urmann’s “Mini Figures with Punches” book (which is available in English, German, French and Italian) in the Everything For Paper Catalogue. 1. Cut a flower from scrap paper with each punch. These will serve as templates. 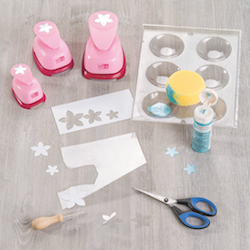 Use a needle tool to transfer each flower onto transparent Creaflexx twice and cut out. Use a sponge to cover the Creaflexx flowers with a thin coat of blue pearlescent acrylic paint. Leave to dry. 2. Lay a sheet of baking parchment on top of a heat-resistant mat so that the Creaflexx won’t stick to the mat whilst warm. We also recommend you wear thin cotton gloves whilst working with Creaflexx as it may get very hot during the heating process. Heat the flowers individually with a heat gun and bend the petals upwards. The smaller the flowers the more the petals should be bent. 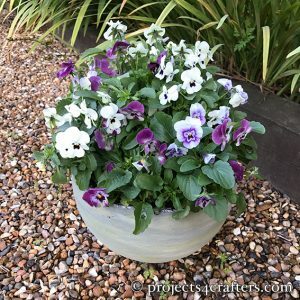 Transparent Creaflexx cools off very quickly, hardens and retains it’s shape. It can be repeatedly heated and petal positions altered. 3. 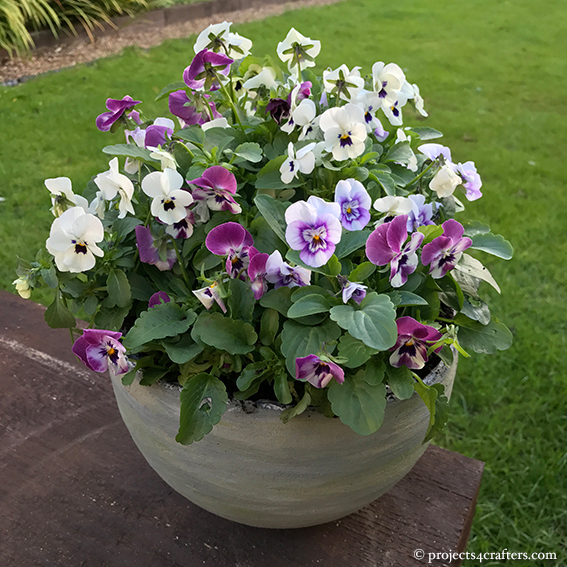 Use a gimlet to make a hole in the centre of each flower except the largest. 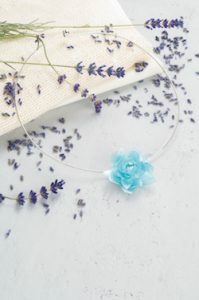 Thread a blue bead onto a headpin followed by the flowers (small to large except the largest). Always a place a dab of hot glue in the flower centres to stop them moving. 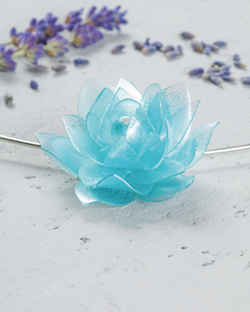 After the last flower, remove the excess headpin with wire cutters and attach the largest flower with a dab of hot glue. Glue the necklace finding to the back of the flower. Temporarily unscrew the ball clasp and straighten the choker wire with jewellery pliers to thread the flower to the desired position. Re-bend the wire and attach the ball clasp. Advantages: malleable when heated – hardens and retains shape once cool – reformable – can easily be cut with scissors – use any heat resistant surface as a former (e.g. cans, edge of a table, tubes etc.) – can also be embossed when warm. 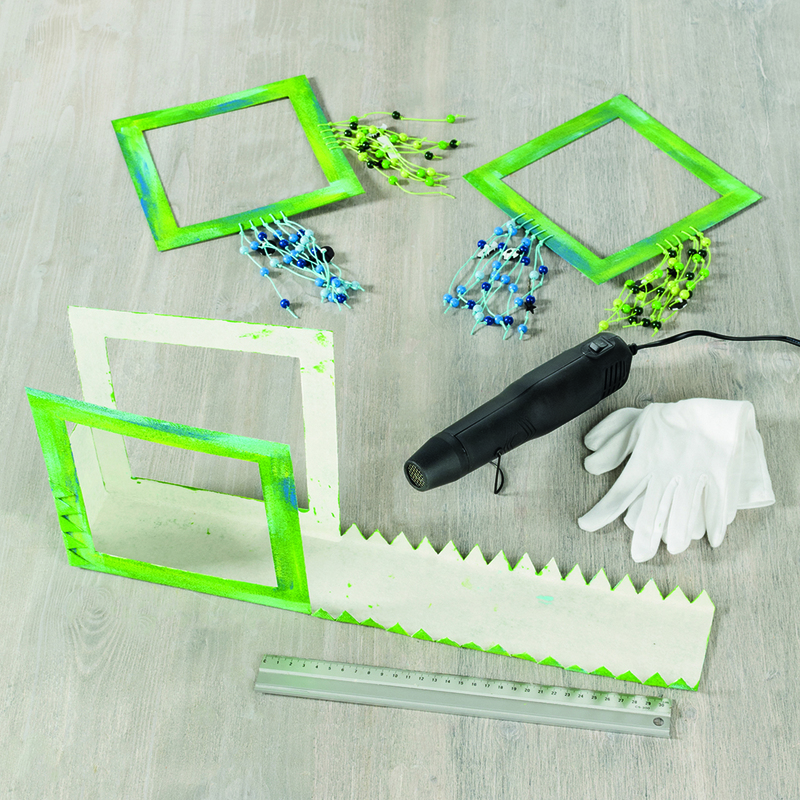 See the Autumn/Winter Trends Catalogue for white and transparent Creaflexx. It is a thermoplastic resin. 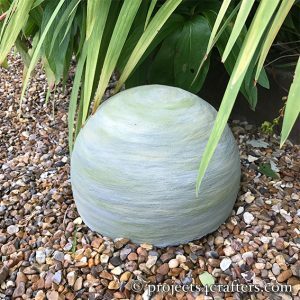 It can be shaped by heating – it solidifies again as soon as it is cold and then retains the form into which it was shaped. This process can be repeated. You can always reheat Creaflexx and bring it back to form into another shape. 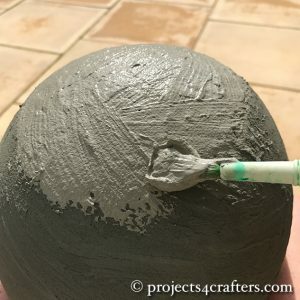 – It is recommended to work on a heat-resistant surface and place a layer of baking paper on top of it so that the Creaflexx can not stick to the surface when it is warm. – Since the material can become very hot, we recommend wearing thin cotton gloves whilst working with Creaflexx. 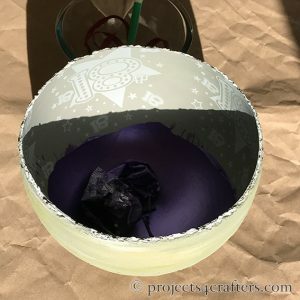 – If one area is heated for too long, or if the material becomes too hot, the transparent Creaflexx may become milky white. – The transparent Creaflexx has no adhesive side like the white Creaflexx. – You always need adhesive to fix it, e.g. UHU Kraft all-purpose adhesive (remains milky after drying) or hot glue gun (clear, but you can still see the glue if the Creaflexx is not painted). 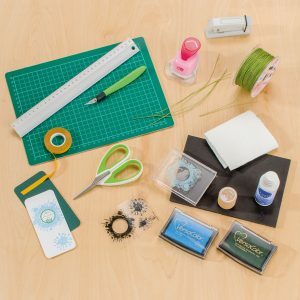 – It has two smooth non-adhesive sides. In comparison to the white Creaflexx, the transparent Creaflexx must be warmed longer and it also cools and hardens faster. – Creaflexx can be used, e.g. over table edges, metal cans or pipes. There should always be a layer of baking paper between Creaflexx and the substrate so that the material does not stick. The substate which is to be used as a mold, should be heat-resistant. 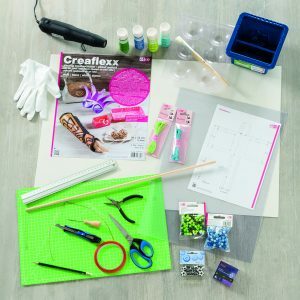 – Creaflexx can be decorated with acrylic paint as desired. 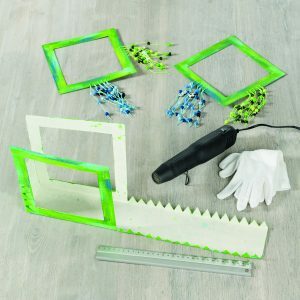 – For better durability of the painted surface and a higher resistance to abrasion, it is recommended to finish the piece with a coat of varnish. – Paints and varnish dry very slowly.